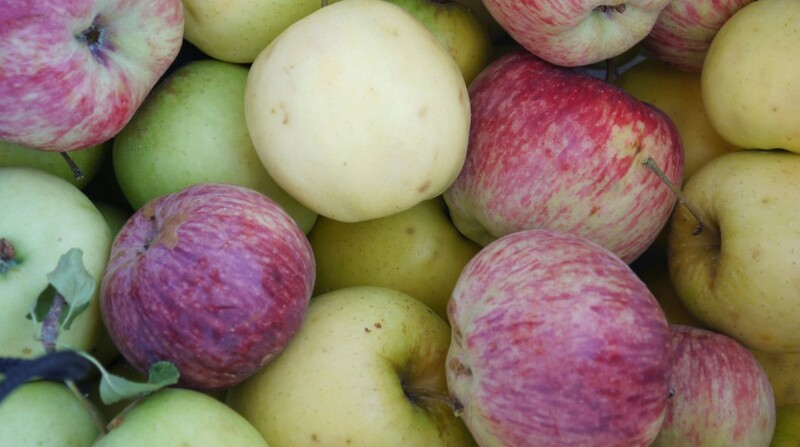 Since my husband is British, I’ve been introduced to and grown to love many English ingredients and products. One of these is McVitie’s Digestive Biscuits, especially the ones with chocolate. If you aren’t familiar with them, digestives are the English version of a graham cracker, but infinitely more delicious than those cardboard things that Nabisco makes. Digestives were created by two Scottish doctors in the late 1800’s to aid in digestion. It was thought at the time that the bicarbonate of soda used in the biscuits had a soothing effect on the tummy. I’ve also read that they were promoted as a good source of fiber to the British public after WW2 – all that rationed white food causing numerous gastro issues. 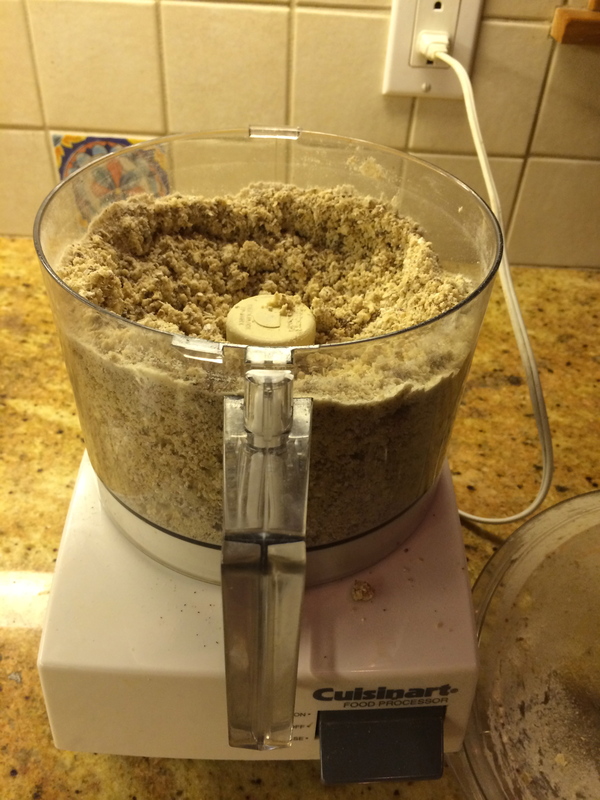 Recently I ran across a recipe for digestives and had to give it a try. The cookies came out really well, in part, because of a couple key ingredients. 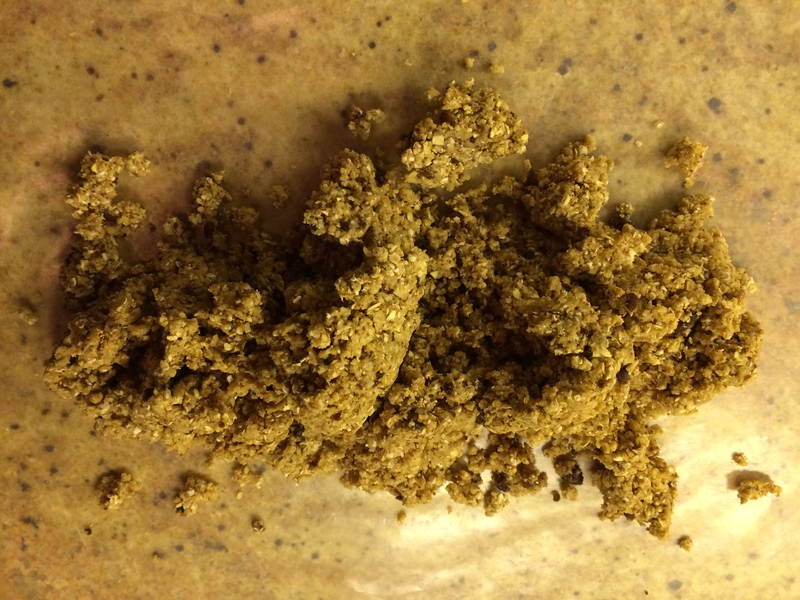 English brown sugar has a deep, dark caramel flavor that adds a rustic sweetness. Find it in the English section of some grocery stores or on Amazon.com. 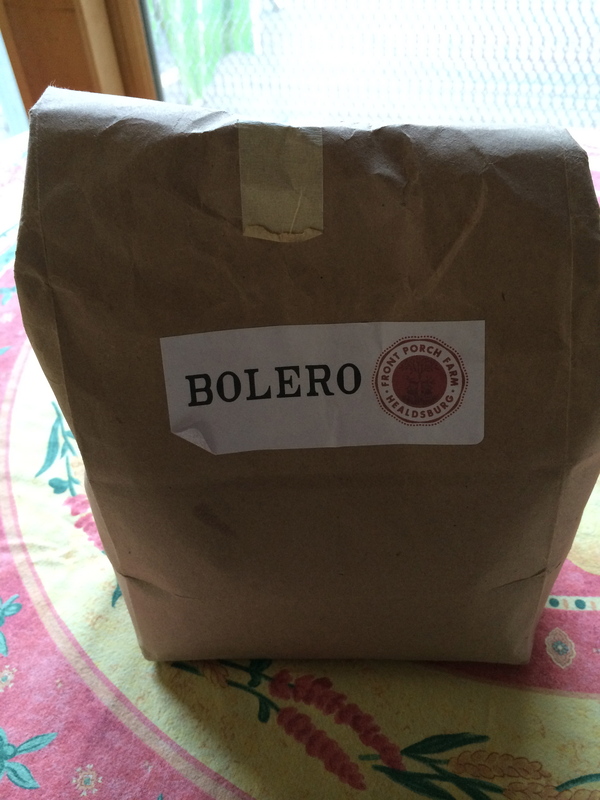 Locally grown and milled wheat flour, Bolero, from Front Porch Farm in Sonoma County added a malty, homespun texture. The recipe is very easy to make. 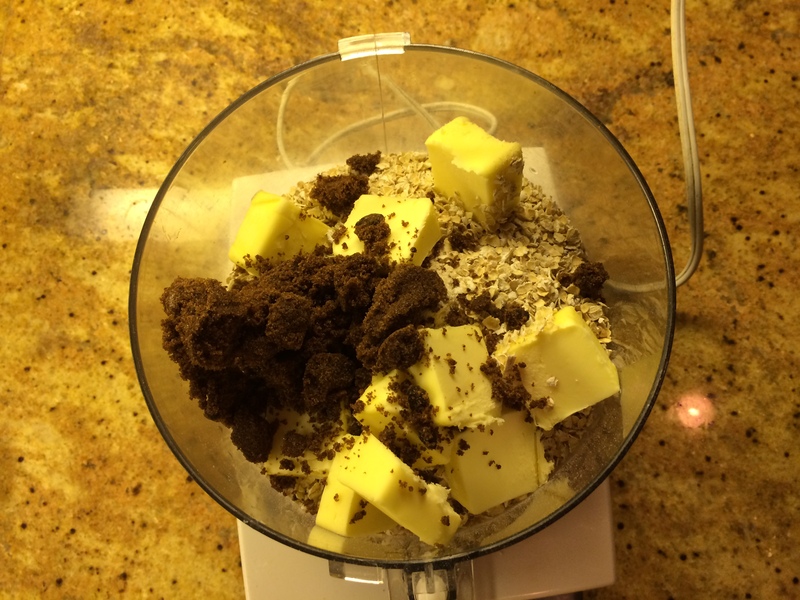 First put all the dry ingredients and butter into a food processor. Pulse until the mixture looks like coarse meal and the butter is evenly distributed. 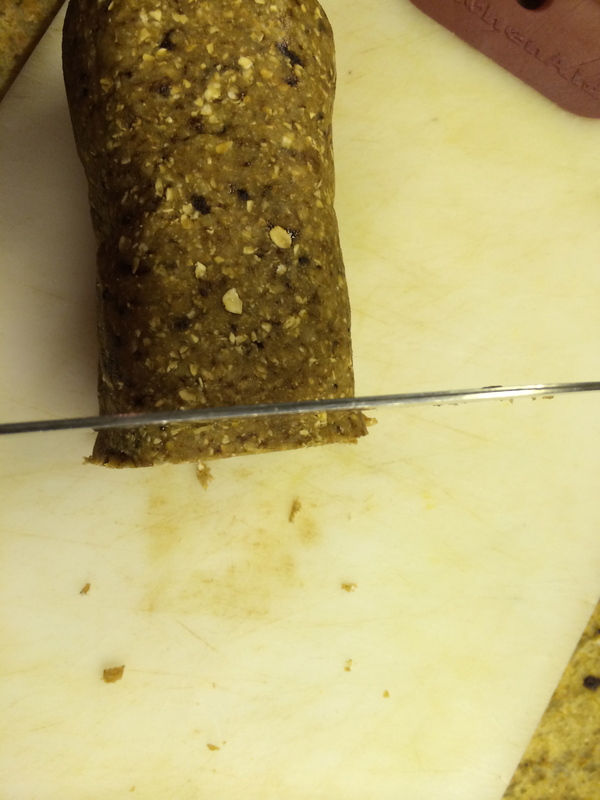 Form the dough into a 3″ wide roll, using the waxed paper to help you shape and smooth the roll. Refrigerate for 1 hour. 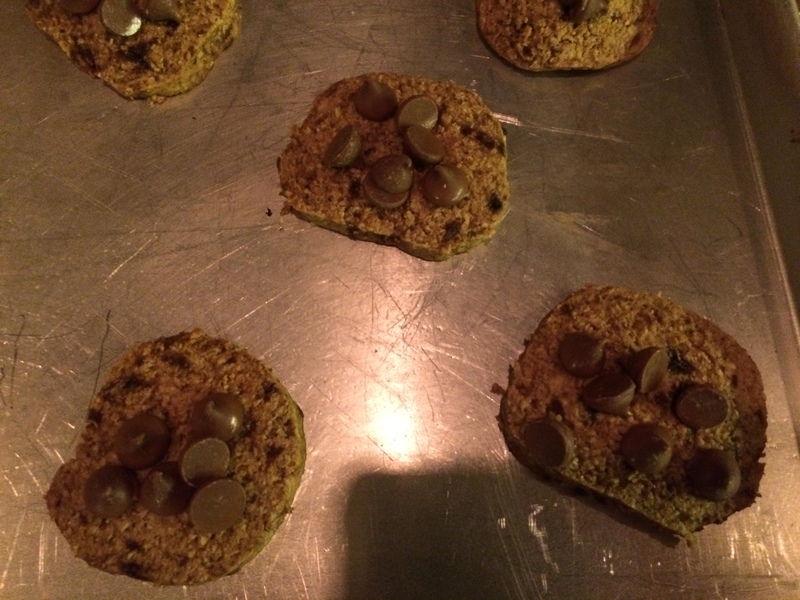 Slice dough into 1/2″ thick rounds and place on a cookie sheet, leaving 1″ between cookies. Bake at 350F for 10-12 minutes. Using an offset spatula, spread the chocolate over the top of each digestive then refrigerate until chocolate has firmed. Enjoy with a cup of tea in the afternoon for that Downton Abbey feeling. 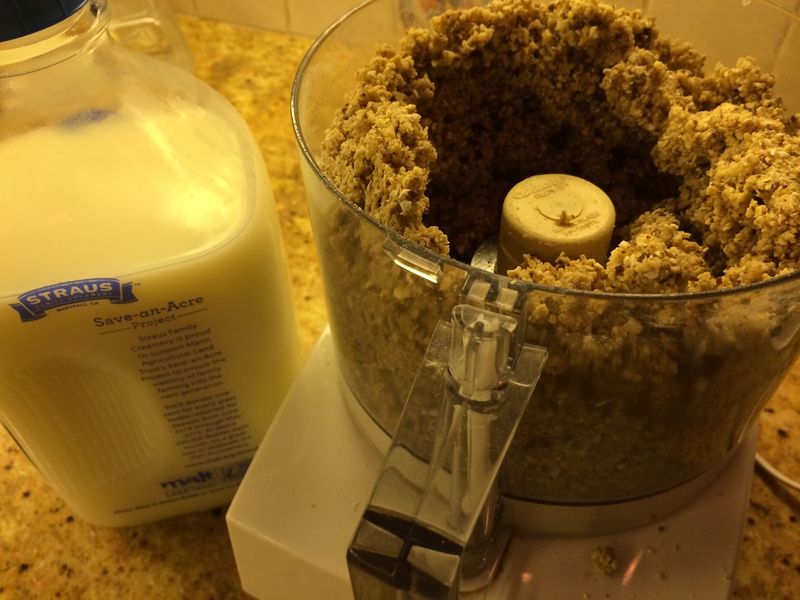 Put flour, baking soda, salt, brown sugar and butter chunks in the food processor and pulse until incorporated. Add milk through the feed tube with the machine running just until dough comes together. 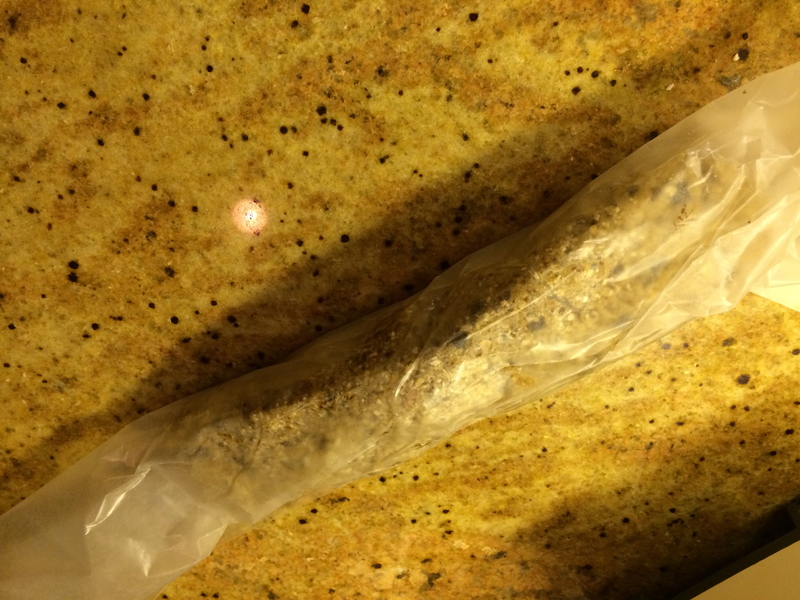 Scrape dough onto a sheet of waxed paper and form into a 3″ wide roll. Chill for one hour. Preheat oven to 350F. 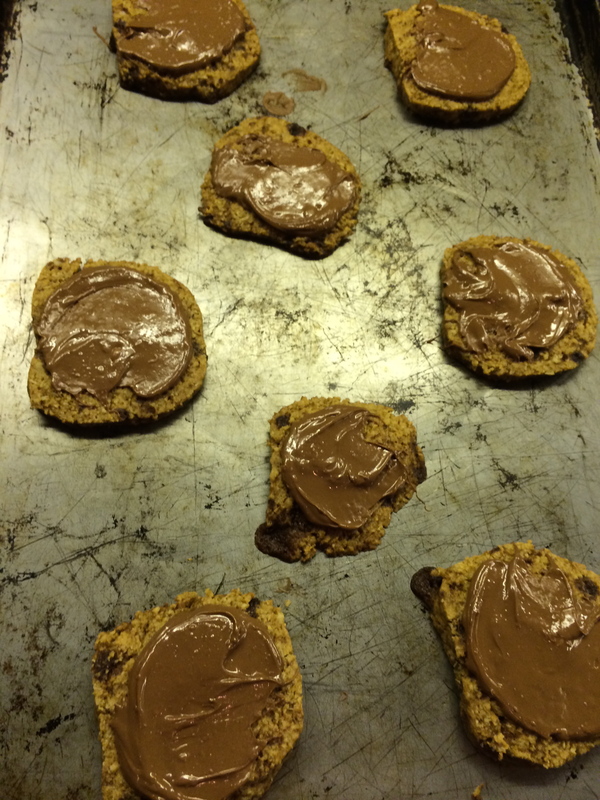 Slice dough into 1/2″ thick rounds and space on greased cookie sheets with 1″ between cookies. Bake for 10-12 minutes until cookies are golden brown and firm, switching tray positions in the oven after 6 minutes. Sprinkle 12 chocolate chips on the top of each biscuit then put back in hot oven for 30 seconds. 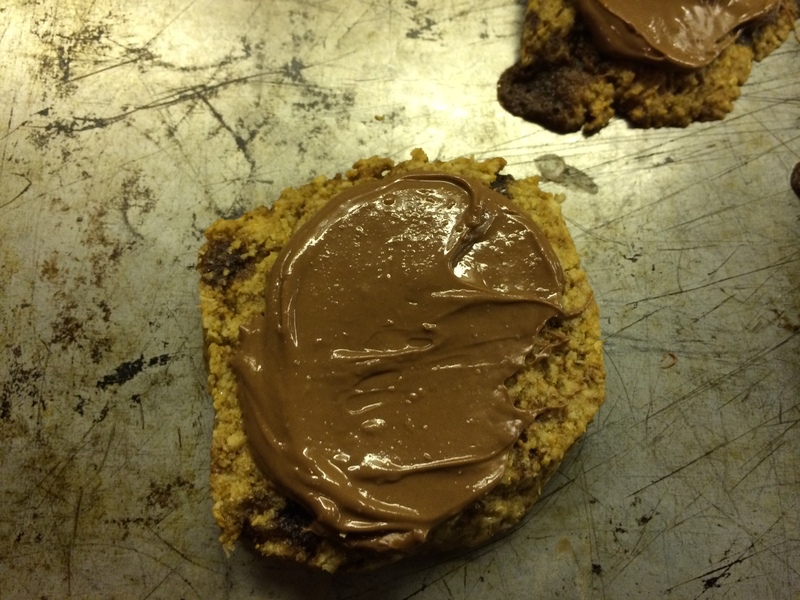 Remove from oven and, using an offset spatula, spread melted chocolate evenly over the surface of each digestive. Chill in fridge until chocolate is set then store in a cookie jar. 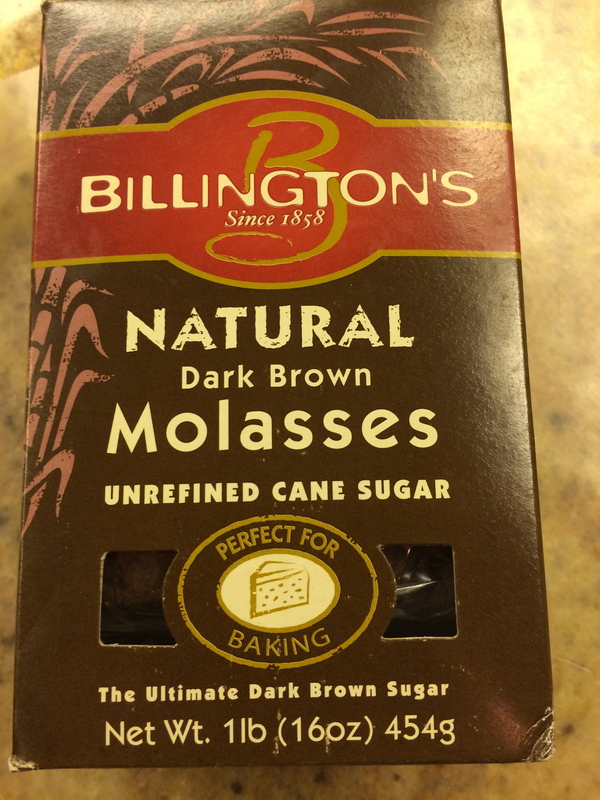 This entry was posted in Desserts, Recipes and tagged biscuit, brown sugar, chocolate, chocolate chips, cookie, digestive, Digestive Biscuits, food processor, wheat flour. Bookmark the permalink.